Investors who attempted to try to time the market’s lows and highs have on the long run received a worse return on their investment than those who simply remained invested. On average, investors who bought and hold, rather than tried to time the market, received an average annualized return of 7.61 percent since 1989, research by the Wells Fargo Investment Institute shows. The chart also shows that missing the single best days can put a dent in investors’ long term returns. As investors missed more of the asset’s “best days” they, on average, received a lower return on their investments. 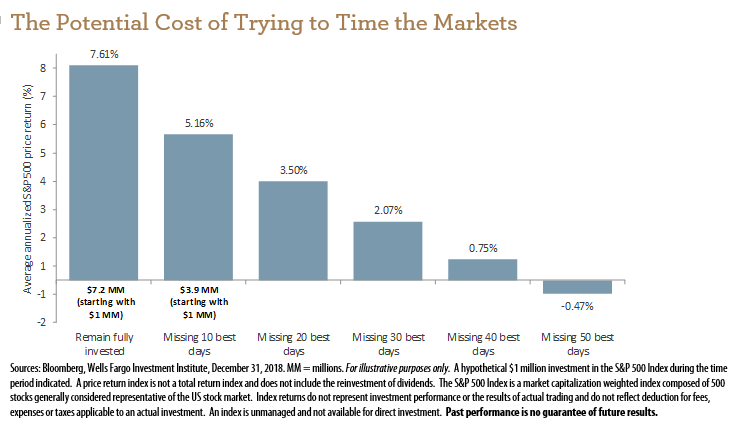 The data show that investors who missed the 10 best days of performance received an average return of 5.16 percent, while investors that missed the 40 best days only received an average return of 0.47 percent. Those who missed the asset’s 50 best days received a return of -0.47 percent. “Investors who attempt to time the market — or react to a single market event or an overstated headline — risk getting caught on the wrong side of a market move,” wrote Tracie McMillion, CFA, Head of Global Asset Allocation Strategy. The data, therefore, shows that investors who were remained fully invested in their assets for the long term, received a much larger return on the long run. Is China Outpacing the U.S. in AI and 5G?